Twofold messages from the I-CHING oracle today! Find the extraordinary in the ordinary (love that one!) and attend to small details—pace yourself. Inspired by Kua 62 called “Small Is Beautiful” or “Attention to Detail and Small Tasks”, the message is to be joyful about small achievements done well and enjoy success in moderate endeavors. KISS is a good motto for today—K.eep I.t S.imple S.weetie! Handle everything today as if it is “butterfly wings”—be very gentle and delicate. It’s a good day to simplify and find the joy in tending to ordinary details. Check your breath frequently—don’t hold and stay relaxed. The Moon is nearly full right now in the earthy-work sign of Capricorn and energy is building. We may feel a bit overwhelmed by details and work that needs doing; but, easy does it! Remember that we are here to enjoy life as well as to accomplish goals—without a mental attitude of struggle, everything will get done and with a smile on your face to boot. PERSONAL NOTE: I may not be able to blog again for a week or so; but will try to get some in as opportunities arise for a post. Essentially, for subscribers of this blog, I will be back to work fully on the 23rd; between now and then I will be having company from out-of-town and then will be out-of-town myself. This has to do with an issue of a family reunion! Will be back soon…. PS—I’m seeing signs of very, very early fall here in the mountains of North Carolina! It’s still hot during the day but our evenings and mornings are beautiful now! 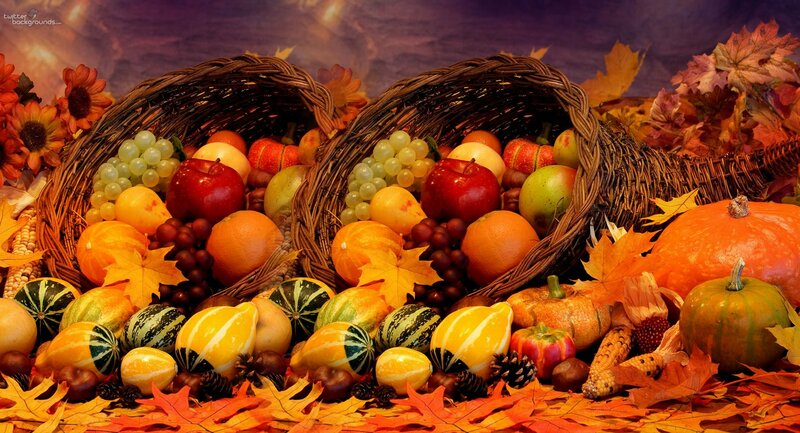 Autumn is my favorite time of year—but then, I’m a Libra Sun; so I suppose that’s natural. Enthused, zapped, lit up, electrified and turned on with energy—can you feel it? Today take that bridge to the world of Joy and Enthusiasm! There’s nothing like it under the Sun and speaking of Sun, let’s add on Optimism and Celebration! Enthusiasm has nothing to do with ego; rather, its in connection to The Divine that we experience it– and in doing so, we joyously merge with Life and with others. Something is shifting—perhaps it is because July is now behind us and we have the optimism of the new month ahead; but something has definitely shifted. Astrologically, we have Mercury in nearly an exact opposition to Neptune which can illuminate the ever-present grace of The Divine; the ocean (Neptune) of inspiration is communicating (Mercury) with us! 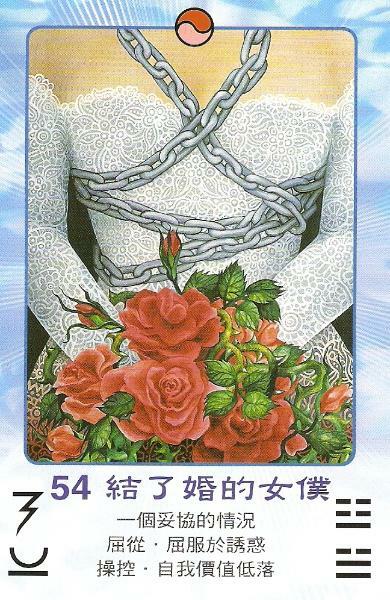 The image for the I-CHING Kua 16/Enthusiasm is a perfect representation of a Cosmic Neptune and Communicative Mercury. 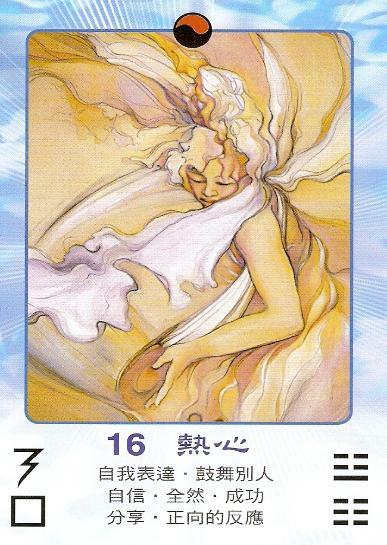 The keyword for today is Enthusiasm and you will do well to create it wherever and however you can and share it with others—it should be easy. Today is a great day to inspire others and even the most daunting goals can be achieved easily with a little Enthusiasm; that grace is easily obtainable today. Take time to celebrate today; never underestimate the power of shared Enthusiasm. The increase in confidence that Enthusiasm provides today will help you successfully achieve any endeavor. Enthusiasm is generated by inspiration and the planet of inspiration (Neptune) is making a direct hit to the planet of communication (Mercury). But now I’m repeating myself. Mercury and Neptune will oppose until August 8th. It’s a great day; a great week (just like it is any time but especially NOW) to be touched by the illuminating creative power of Enthusiasm! It rained all day and my elbow was hurting from doing too much yard work and I felt a headache coming on—What do I need? What do I need? –that was the mantra for me yesterday. I decided it was a haircut which I did myself. I cut off a good 4 inches and felt much lighter. Then I acted on doing small things that I’d been putting off and one thing to another mixed with doing an hour aerobic workout, a meditation, housework and by the end of the day I was feeling good as new again. 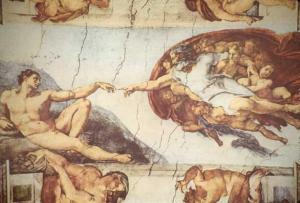 Essentially, I took the advice/guidance of Kua 27 and nurtured body, mind and spirit. Health and well-being goes beyond being free from disease—our body, mind and spirit must be in balanced in order to radiate light. Mine wasn’t. Today’s message is to ask the self what is needed in order to restore balance in the mind/body/spirit. Sometimes what is needed is to change our daily routine and “clean up our act” (in my case yesterday, housework and a haircut and no blog post). Kua 27 is called “The Corners of the Mouth” OR “Providing Sustenance”. How can you provide nourishment for yourself today? Let your intuition guide you. Innocence is the ability to pay attention to the inner voice of intuition and to spontaneously respond to life unfolding in the now. The members of the psychic class group are currently having a big discussion on diet and foods and fasting and onward—pulling this rune for today’s cosmic communiqué relates (I believe) to trusting the body’s wisdom in each moment which was my contribution to discussions on the topic. 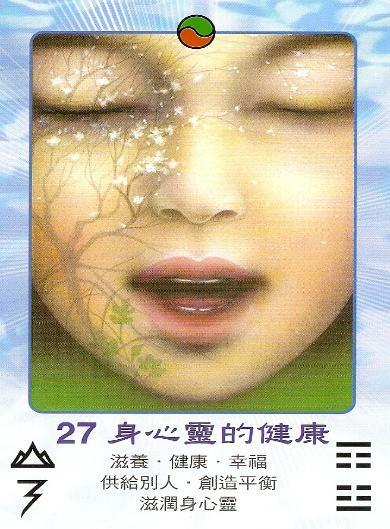 Today’s message comes from Kua 25 of the I CHING, called “Innocence” –human nature directed by spirit. This Kua is also called “Simple Purpose”—following the true inclination of the heart. The Wilhelm/Baynes Book of Changes says this about Kua 25: By devotion to the divine spirit within the self, innocence is attained that leads to do the right thing with ‘instinctive’ sureness without any thought. I can’t help but think of babies and their diet. Moms tend to worry about what their children eat. Maybe I’m old fashioned (probably, I’m getting old… ) but ‘back in the day’ the pediatricians would say to offer the child a variety of healthy foods and the child’s body wisdom will direct them. I noticed that this was true overall—lots of noodles one day and the next day lots of carrots. It seemed to balance out without me injecting any food anxieties. Children have not been programmed to have preferences, to be fixated on ideals, or strive to achieve ego-goals. Children, in their natural innocence, can be such beautiful teachers. … today’s message is gently reminding us of the wisdom gained when we trust the innocence of our own natural spirit. Renew your acquaintance with your natural, childlike, innocent self—there is wisdom there. BOTTOM LINE: Today’s message is to approach each situation as it comes and to be responsive to subtle influences that are the result of sensitivity and enthusiasm. Life is a moment-to-moment flowering, not some problem to be solved. Look at life today through the eyes of an innocent child. To function most effectively (in any situation), it is important to ‘be present’ in each and every moment. Release complex issues in favor of a simple approach. Find the balance you need between childlike confidence and the wisdom of experience. 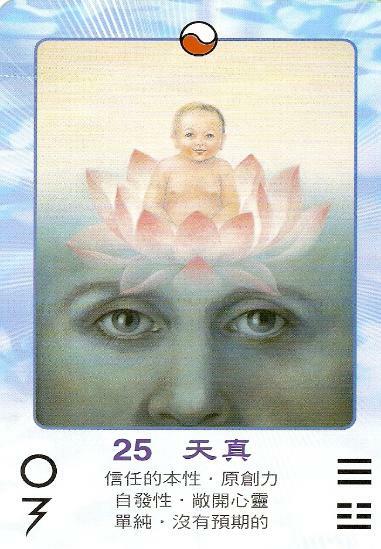 As always, I hope that the Tarot and Astrology archetype correlations help to further clarify the message inspired by today’s I CHING Kua 25, Innocence. See you tomorrow…. Today pause to remember that life has cycles continually unfolding. There will be improvement over the next few months; this is a turning point. Turning points are inevitable and the motion life never really stops; yet pauses do happen during the changes of the cycles and seasons. These are moments when the world seems to hold its breath while a shift occurs. Sensitive people can sense these transitions within their own systems. Take the shift from winter to spring—while there still may be snow on the ground, the promise of spring is felt by those who are sensitive and who feel the quickening that happens beneath the earth; the daffodils are ready to come up even though there are no early shoots above the ground, a sensitive person and feel the stirrings of spring. If your efforts seem to be at a standstill, remember the lesson of the season of winter into spring given in the paragraph above. We trust the seasons in nature and should hold the same trust in the inevitability of change in our personal lives as well. Natural Law! Nature is an awesome instructor, especially in regard to lessons of divine or ‘right’ timing. There are times in our lives when we cannot effect change and just like the message of yesterday’s blog (Kua 13) we can only wait—just like we wait for spring each year. Spring will come when it will—and we know it will–and there’s nothing at all we can do to hurry it along. That’s the epitome of today’s message which is very similar to yesterdays. Another good example of today’s message has to do with the steady improvements that come as we recover from a cold or flu. We may try to push forward as we sense an improvement from the day before but as we do, we only have to rest again—more recuperation is needed. We cannot ‘bounce back’ until our energy has been replenished. The greater point of today’s message is that there are times when there is nothing we can do but have faith because “doing something” doesn’t help, it only hinders at these times. Certain times it is best not to interfere; oh, yes, we can try but soon find that it gets us nowhere and we need to return and release attachments. Today’s message is to take care of yourself while a transition is occurring in your life. Look inward and be in touch with The Divine within you. Be gentle with yourself today; don’t try to accomplish too much. Let your energy be recharged now and remember nature—the ebb and flow of the ocean. Be receptive and patient, not too outgoing. The next few months will show steady improvement. The Astrological Correlations for the I CHING Kua 24 are Capricorn (withdrawal), Aquarius (detachment) and Pisces (expanded awareness). 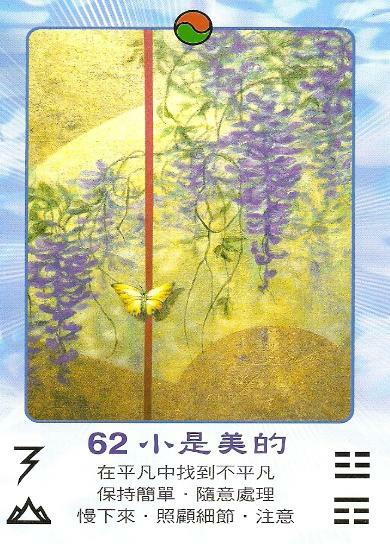 Practice using your will – that is the first impression that came when I drew this card for today’s divination message. This requires tenacity, determination and courage. I often hear the Dalai Lama use those words together like that. I love the way he says, “Determined effort!” with the sound of the wisdom gained from experienced behind them. The next link that comes with this is as long as your will doesn’t interfere with another person’s will to express theirs. The Dalai Lama often uses his phrase “determined effort” when he is describing being devoted to one’s own path and regarding spiritual efforts. Determined in the way of the peaceful warrior—a warrior that is receptive to the inner guidance that is always flowing toward the conscious mind. A side message: Who’s will? 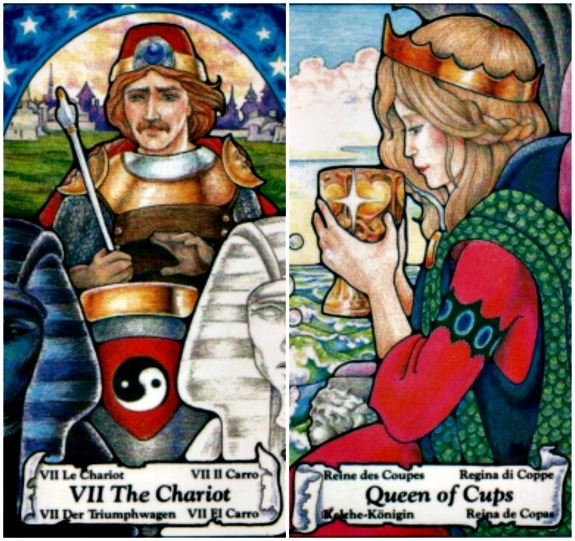 So many times we see those who cannot control their own emotions (Cancer relates to The Chariot) will try to control others, using their will to overpower another instead of using the will to discipline the self and master the self-emotions. The Chariot reminds us that this is a perverted mis-use of power! In the image of The Chariot on the tarot card, we see the vehicle as the manifestation here on earth of the physical body and personality/ego. Today’s message is about our use of our “vehicle” as an expression of our true self and about how to use this vehicle (physical body and personality/ego) in such a way that we are sheltered from or protected against the bombardment of thoughts from race consciousness or what some would call the “insane world”. 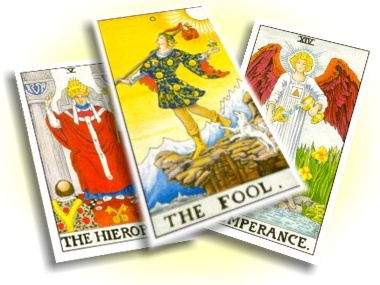 Patterns of thought—mostly thought about life needing to be a “struggle”—is what the human that we see on the image of the tarot card is using his “vehicle” to drive through or separate from. He has taken refuge within even whilst in the midst of life on earth. He is liberating from old patterns of thought that bind him and he is learning to distinguish between the true desires of the enlightened self from the compulsive (and sometimes obsessive) desires of the un-awakened self. How is this achieved? Here’s where the zodiac sign of Cancer (ruled by the Moon) comes into play. Through the study of his emotions! The Moon and Cancer relate to emotions and also to self-image or creating an self-identity through which to function. Learning to control those emotions by taking the middle way in life between life’s polarities and stilling the mind and using the powers of concentration—directing his will in that way with, as the Tibetan holy man would say, “With determined effort!” This helps the mind function “as a whole”—key words. Mind and body and spirit functioning as a whole will allow the ch’i (the natural energy of the universe) to flow freely. If you have been following my blog posts the last couple of days or so, the new reality or the idea of waking from the dream to create a new one has been a theme. Today the message follows that we have the ability now to create anew and a choice to implement but what follows is the need for determined effort and this effort is enhanced by creating balance within. Emotions must be in balance with mind and body so that one receives the energy to express the determined effort to create from choice (see last blog post regarding choice). Practice—practice using one’s will in whatever way it is necessary in any given moment. That’s what today’s message is about. Fix the mind and heart on a goal–these are the messages of the Chariot; and concentrate your energies (determined effort) on mastering your emotions so that your “vehicle” can be strong enough to hold you, carry you, and transport you throughout your travels. Right now we see structures are dissolving and new ones being born and this uncertainty create feelings of instability and insecurity. As humans we want to be secure, to feel secure. Who doesn’t? But it seems that we have to step out of our safety zone or comfort zone in order to have new experiences and grow—it seems (to me) that everyone is getting on global or universal message during this time and that is to release old structures so new experiences can happen and so growth can occur. 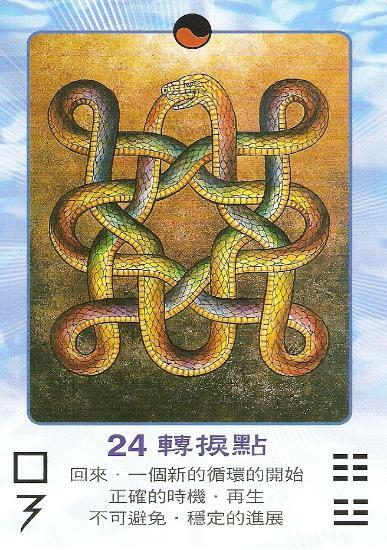 We can either let our insecurities and obsessive thoughts get the better of us and try to go back into the old pattern (which won’t work by the way) or we can use the message the comes through today about determined effort and balancing the emotions right now so that effort can be applied to new choices we will be making. A new level of self-mastery is being called for. 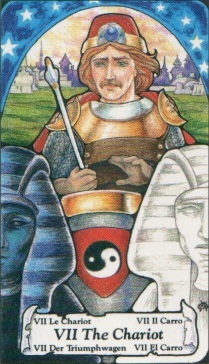 The Chariot card and Cancer represent positive aspects of the ego (the vehicle). Strong, self-assured confidence is what today’s message is about. Just as a final note, this card always brings to mind that a successful outcome is assured so there’s no real need to get too ‘gawd-awful’ serious about it all. We should try, as best we can, to enjoy the journey. It’s over all too soon!